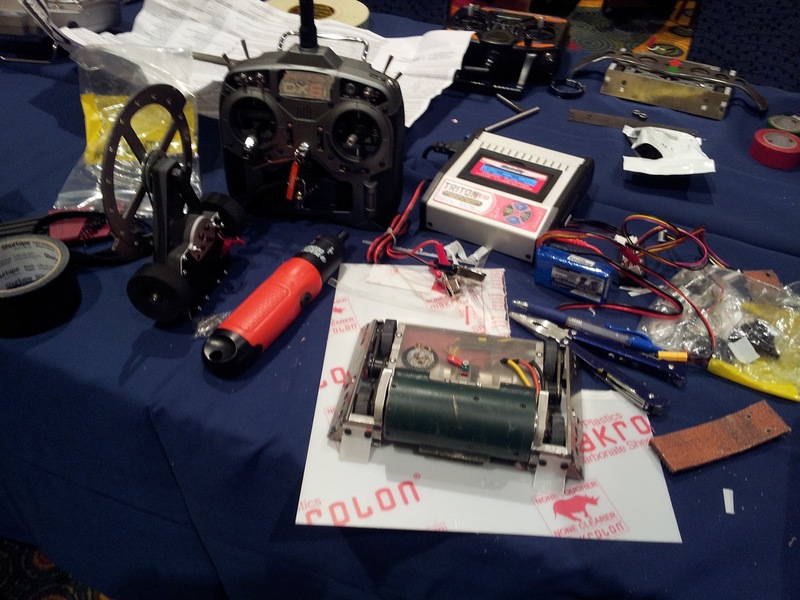 My most recent scooter (that I built and haven't yet blogged about) uses a 7s2p Lithium Iron Phosphate pack using A123 cells. That is great except my Triton EQ charger can only handle 6s Lithium anything. The obvious solution was to purchase new charging equipment like this beautiful Turnigy 8s charger capable of 7A continuous. However, it also means I need to find a suitable power supply that can output at least 4.6A at ~23.1V with an input range of 11 to 15V. That last requirement removes most laptop power supplies from the list of hopefuls. But, it does shine some light on my favorite gaming platform, the Xbox 360. 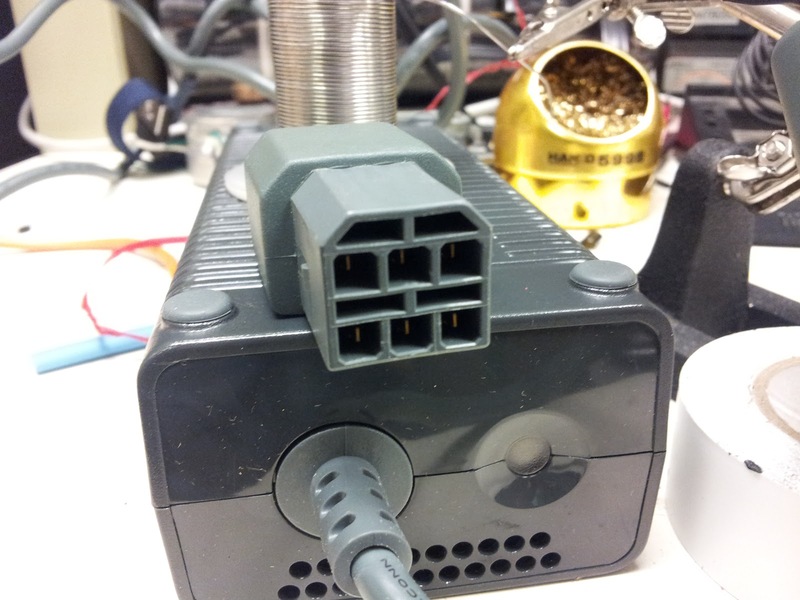 The 360 variants feature external power supplies with some funky 8 pin output cable. Furthermore there are variants that output some 135W (Xbox 360 Slim) to 203W (Xbox 360 original console) of power. My favorite part about these power supplies is they can be obtained for cheap because they are available everywhere. I grabbed a 150W variant off ebay for $18 free shipping. Alright! Hacking time! I received my box and noted many familiar items. Wall plug, power brick, lalala... oh wait. What the hell is this? Some 8-pin output connector that goes into the Xbox. No clear labeling on the outside to signify the purpose of the pins. Courtesy of that website. Kudos go to them. 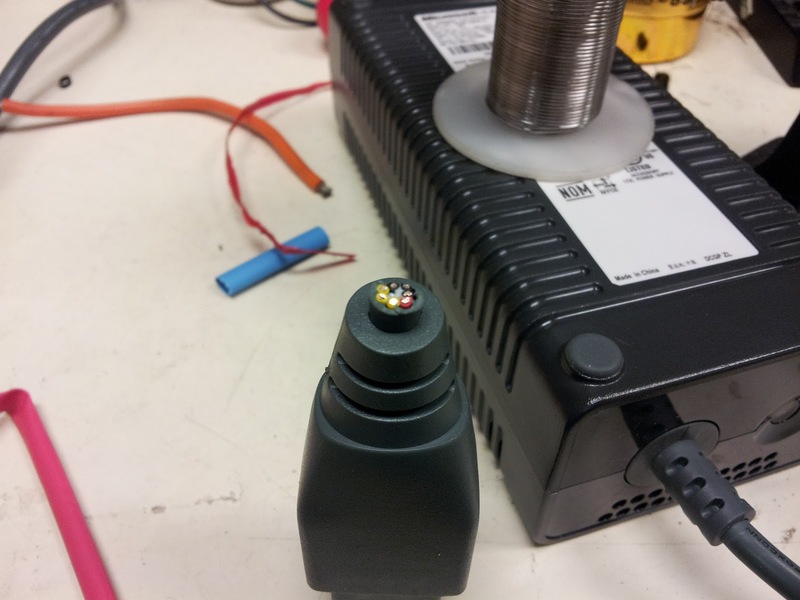 If you were to probe the outputs with a multimeter, you will find a 0V potential between the yellow and black UNTIL you supply the PWR_ENABLE pin with +5V. We are going to simply take the +5V USB line (RED) and connect it to the PWR_ENABLE permanently. 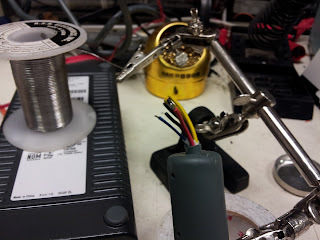 Then we will connect the yellow and black wires together in parallel because I don't feel like 22ga PVC jacket wire is ever going to safety transmit 150W. Anyway, I unplugged the charger cord, and immediately sliced into the cable behind the connector. Conveniently enough, the cables are colored accordingly. 8 pins, 8 wires. Life is good. Strip away more wire and begin soldering things together. Three BLACK in paralle, three YELLOW in parallel, and connect the BLUE and RED/PURPLE. Your choice on the shrink wrap and external connector. A good choice might be a power strip in case you want to power multiple items with it. 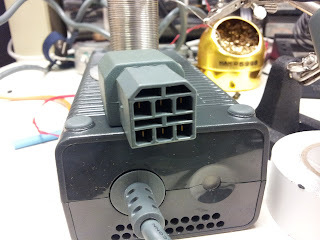 Since this power supply is single duty, I soldered in an XT60 connector used for hobby RC. On Friday evening we hadn't left Atlanta until maybe 10 or 11 because SOME PEOPLE were beast-mode machining their robots. Piled into two cars and drove up to Nashville some 4-5 hours later. The next morning we rolled out of bed to the hotel and set up for the Geek Media Expo's second annual Robot Battled event, or Robot Battles 45 if you'll have it. 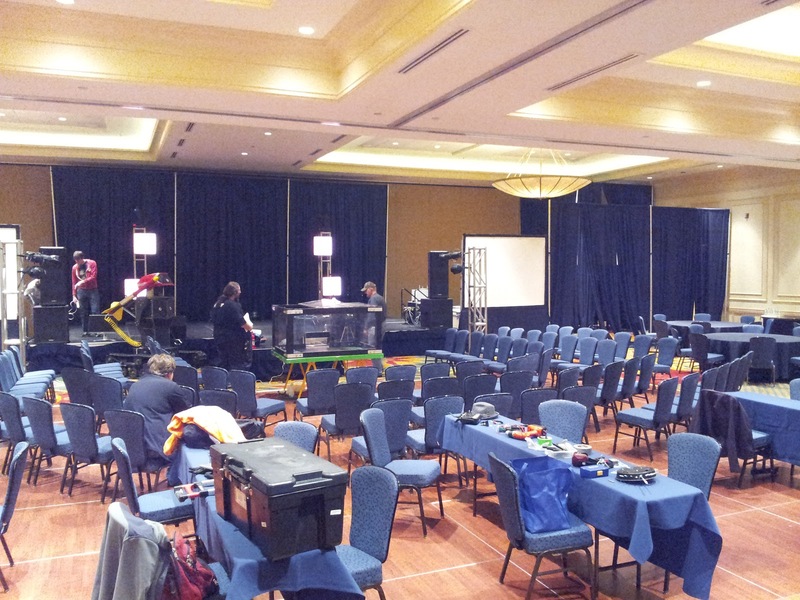 As we entered, the arena provided by Thomas Kenny was being set up. It was a smaller 4 x 4' arena with a pushout. I was slightly worried about DDT's spin-up time and bouncing but it definitely favored Dominant Mode who operates very well in tight conditions. 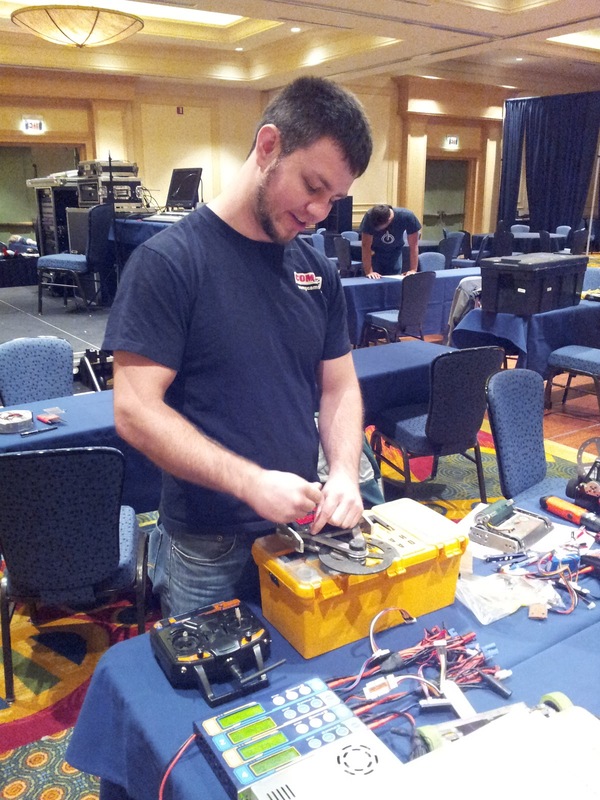 The Georgia Tech crew brought several robots. We had two antweights between Jim and myself, and six beetleweights created by Gabe Ochoa, Dan Hammer, Xo Wang, Aaron fan, Greg (who wasn't actually there), and myself. 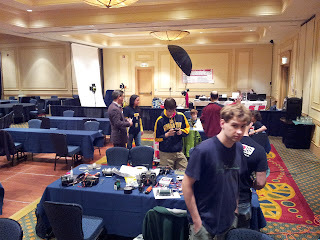 GT crew and the compound table. There ended up being two other antweights, and 2 other beetleweights. Therefore the ants ran double round robin and the beetles ran double elimination. Needless to say, Georgia Tech was over half the competition. Robots preparing. Everyone looks nice and undamaged right now. 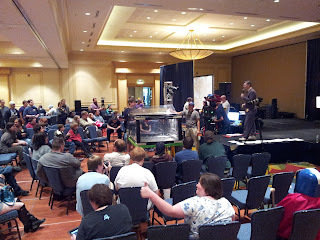 Jim Shealy adds tape to the base of Quantum Platypus to dampen the other spinners. 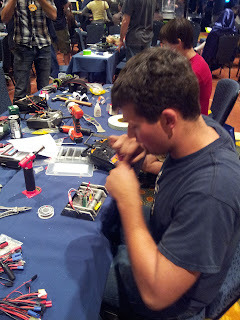 Dan Hammer working on "The hammer"
Gabe Ochoa, the builder of Mowbot, adding the final preparations. 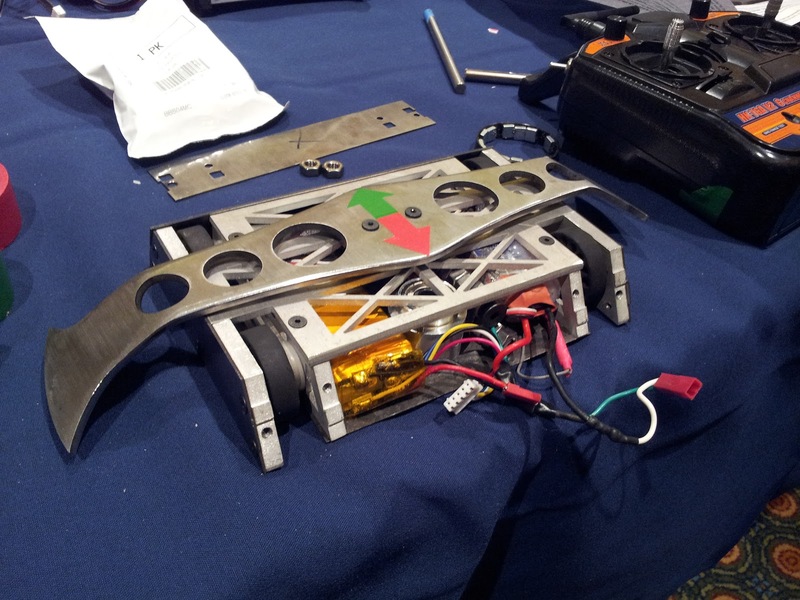 Mowbot, the champion of the AMMF Robot Battles, sporting a new frame and blade. Quantum Platypus, the enormous overhead disk spinner. Gyro King, the massive melty bot made by Aaron Fan and Xo Wang. My things. Last minute polycarbonate anti-wedge additions being made. DDT proved to have no problem with weapon power. Instant spin up time and enough power to keep it bouncing around the arena. This is not quite compensation for its inability to drive inverted, but it certainly helps. Quantum Platypus's foam adhesives worked well at first, but when DDT struck frame things began to fall apart. DDT wins by JD. I feel bad for destroying the floor. Dang! First beetle match of the morning is going to be a big one. 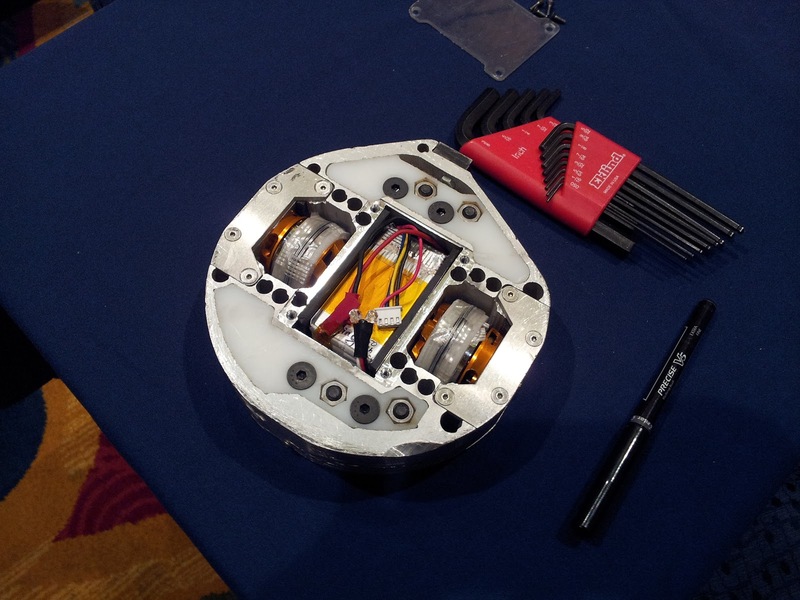 Gyro King is a melty brain robot with large 35mm brushless motors for wheels and a solid aluminum frame waterjet from a single billet of 1.5" aluminum. To add to its impressiveness, its motor controllers and bluetooth communications were custom made AND it has hardened s7 teeth. Dominant Mode's drum was rather soft 4130 so I was anticipating the worst. My initial strategy was to box rush, but it doesn't always work out as planned. Dom takes a nice bite from the tooth support after removing the S7 teeth. Gyro King was having trouble spinning up. It was designed to spin to over 6000 RPMs but was only getting about 2000. Had it been up to full power it might have been far worse for me considering the number of missed rushes. 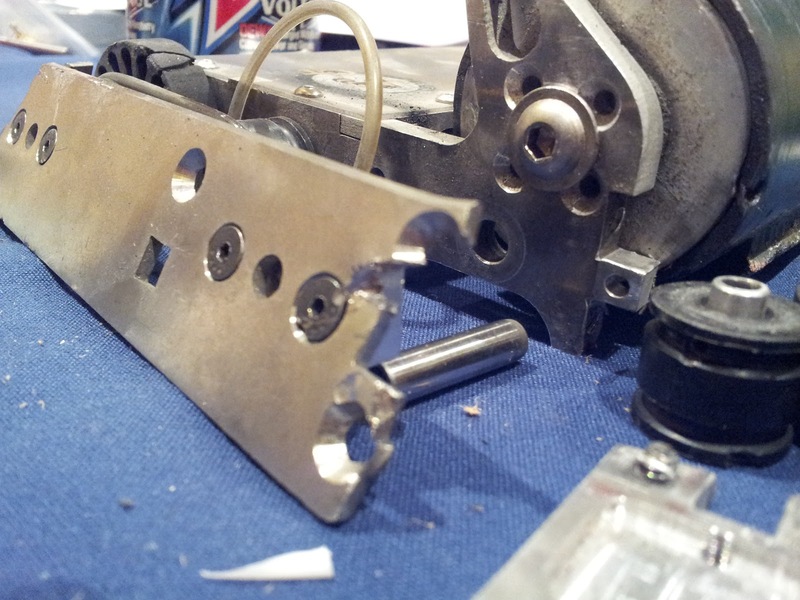 But Dom removed the S7 teeth by shearing the bolts and nearly ejected Gyro King from the arena. 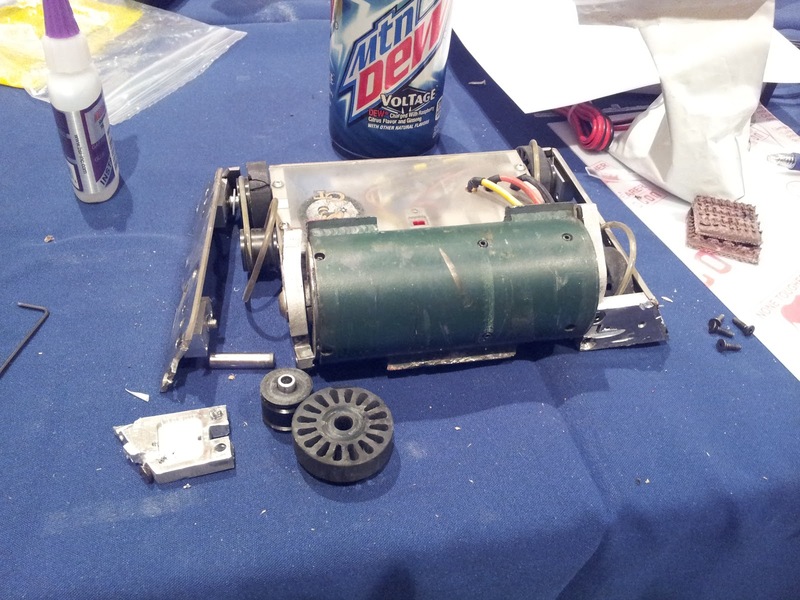 The hit jarred the HDPE dead weights in the robot and high centered its drive wheels. Dom wins by KO. 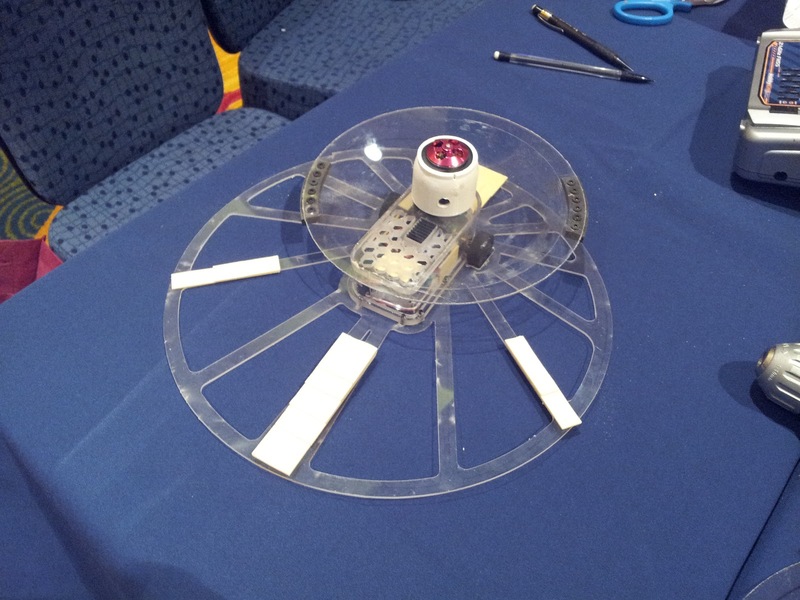 Return to the antweights to fight last year's winner of GMX Robot Battles. Hardboiled was a fast wedge that didn't show and visible weaknesses. A good driver and reliable drive train was enough for it to clench its first round victory against Green Reaper so I expected him to keep on DDT such that I could not spin up. We would see how well the disk spin up time would be now. Seems more than sufficient. Even under load, I could torque the disk and spin both robots apart. This bodes very well for DDT seeing as how disk spin up has plagued the old version. DDT wins with an odd flipping slice. DDT ended up fighting Hardboiled twice more for the round robin format and the championship. All the matches had similar outcomes with equal or greater amounts of bouncing. DDT ends up victorious in both cases. 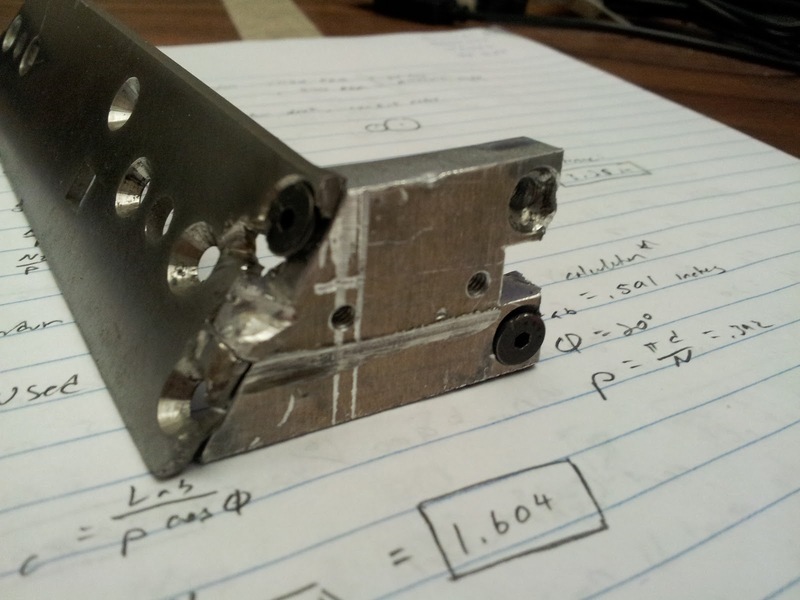 Gregbot ended up flipping early from hitting the wall with its springy steel frame. From then on, it was pretty much over. I don't remember the name of this robot exactly, but it was driven by a bright young fellow with a lot of potential. The robot's body was a inverted cake pan and had all sorts of screws sticking out of it as a defense. Finals time! 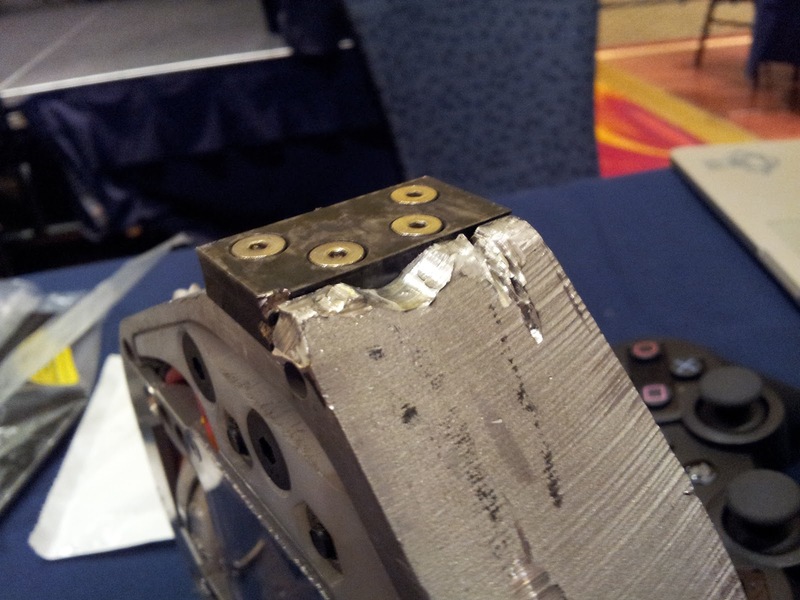 Mowbot suffered some pre-competition damage and was reduced to a pushy bot with a reliable drivetrain. In its last match against Gyro King it suffered a battery short as it was exiting the arena had to be escorted out of the hotel in a fiery bucket. But no harm done, Mowbot was back in action in no time despite looking a bit like it was slapped with baby powder. Gabe and I both knew that we would lock in a pushy match if we went head on because his front and rear wedges were angled to avoid the drum but contact the frame first. I would try and avoid a head on confrontation like that and instead aim for his corners. When the match began, he had me where I didn't want to be: pinned against the wall after head-on contact. 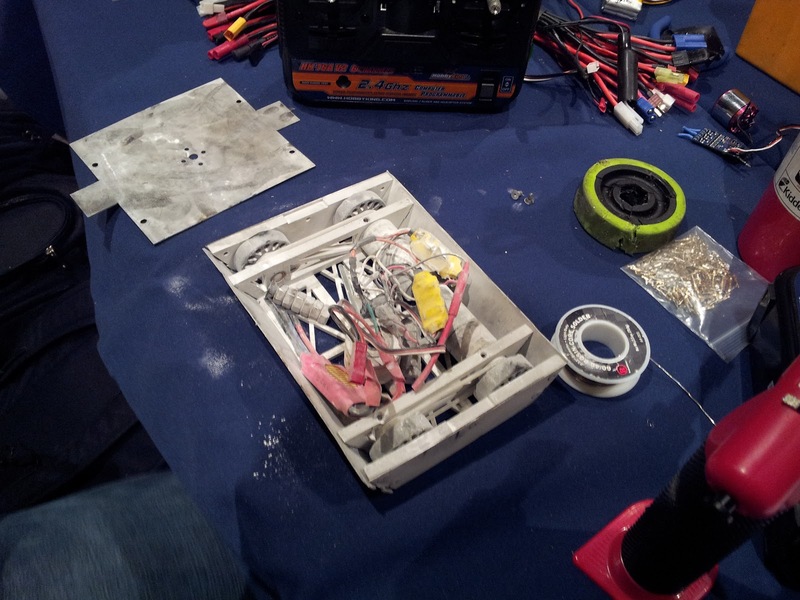 However when he backed up, I struck the front corner which opened up his front panel and exposed his battery. After a brief pause we decided to go pushy bots for the rest of the match. The crowd cheered for good sportsmanship and more robot fighting. However the first charge by both robots was the killing blow. Mowbot darted past Dom with its battery hanging out and Dom tagged the trailing battery, pulling it out of its connector. Dom wins in a hilarious final moment. At the conclusion of the antweight bracket, we held a small rumble with the three remaining robots in the antweight class. It turned into a robot dance-off with DDT suggesting its name should be DDR. Dominant Mode has never had that much damage before. Both sides incompacitated and a drum bearing shattered. It turns out Dan's robot (The Hammer) pierced through the Ti around the front cap and pulled the entire assembly out. I later gave him those parts as a trophy. The drum sounded like maracas because of the loose balls inside. Dan Hammer's trophy from me. 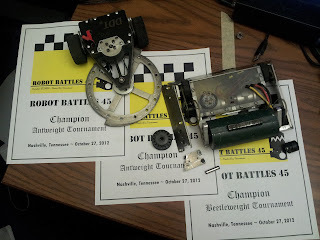 Both robots did well but its clear that that Dom needs work. The frame is still vulnerable to horizontal spinners regardless of the angled sides. The inner rails were also tweaked and bent so there needs to be more work in stiffening the front portions of the frame. The entire competition was pretty rushed for the competitors because of the low number of robots. However, spare batteries and maybe six chargers kept us all going. 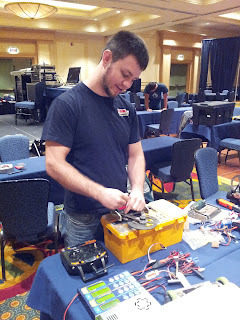 Given the excitement of the group, I have no doubts we will return to GMX and Robot Battles again! Big thanks to Xo Wang and Dan Hammer for the excellent video captures! Also thanks to Thomas, GMX, and the MTRAS crew for a great event! On behalf of the Georgia Tech crew, we thank you for a wonderful time! Other awesome moments of the event.